(a) Remove the rear wiper arm cover. (b) Remove the nut and the RR wiper arm & blade assy. (b) Remove the 3 bolts and the rear wiper motor assy. (a) Install the rear wiper motor assy with the 3 bolts. (a) As shown in the illustration, install the rear wiper motor grommet with its position mark upside. (a) Stop the rear wiper motor assy at the automatic stop position. (b) Scrape off the wiper arm serration with a round file or equivalent. 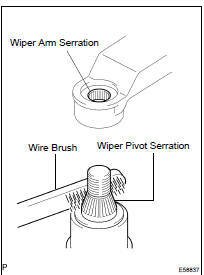 (c) Clean the rear wiper pivot serration with a wire brush. (d) Install the RR wiper arm & blade assy in the position shown in the illustration. (e) Install the RR wiper arm & blade assy with the nut. HINT: Hold down the arm hinge by hand in order to fasten the nut. (f) Install the rear wiper arm cover. (g) Operate the wiper while running water or washer fluid over the window, and check the wiping condition and that the rear wiper does not scrape against the body.